Photo of the day: WHAT DOES SANTA DO AFTER CHRISTMAS CELEBRATE ! ! 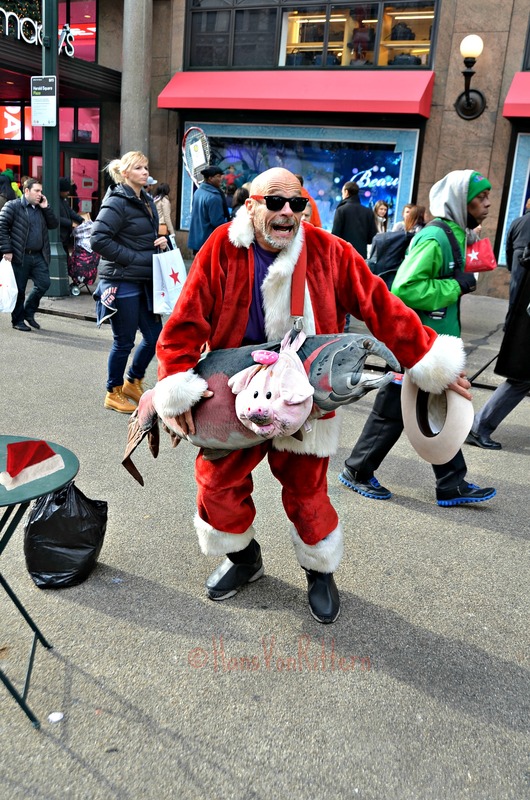 – Here is my ‘poetic’ twist on Clement Moore’s classic poem as I encounter drunk Santa after Christmas in front of Macy*s . . . The prancing and pawing of Santa whose had too much vermouth. Down 34th Street St. Nicholas came with a bound. And he looked like a street peddler just opening his pig pack. His eyes—how they twinkled! His eyes, how blurry! His cheeks and nose were like roses, he surely was in no hurry. That shook when he ranted, like a bowl full of jelly. Happy returns to all, if you kept your receipt – you done right!